The Tennents seem to be gadding around all over the place. Paul is just home from Chicago where he had such a great time he can hardly stop talking about it, and Alton Towers where he apparently had an even better time, and even made several local newspapers and TV programmes (alas none which were shown in Scotland). I'm just about to abandon Rob and the dogs and head for Paris where I'm attending the European Man From UNCLE get-together. We plan to do a lot of sight-seeing, a lot of eating (and moderate drinking as befits a bunch of middle-aged fangirls) and a great deal of MFU watching (if my attempts at ripping off some old videos onto dvd works). The dogs are not pleased and are not letting me out of their sight. Perhaps I'd better go and placate them with extra special walkies now. 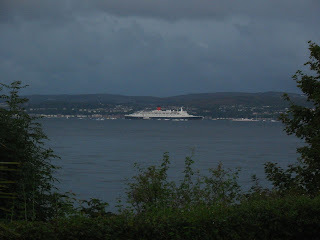 I took this photo from my garden as the QE2 sailed past on her round Britain farewell cruise. I remember her launch not long after we moved to Glasgow - the White Cart river backed up as far as Pollok, near where I lived. She was the last of the great Cunard Queens, the most stately of all cruise ships and one on which it seemed only the super-rich could aspire to sail. But yesterday, many of the people who built her were aboard with their families as guests. I wonder how many of them ever dreamed it would happen, or indeed dreamed that they would live to see the great ship retire. I somehow thought these wonderful vessels went on indefinitely. As I sat in the conservatory sewing curtains for my mother-in-law yesterday, I could see her single red funnel towering above the Greenock sky-line. Then, with a terrifying roar, the Red Arrows (or similar planes from Lossiemouth) flew over us and started an incredible display of aerobatics above Greenock. There was red, white and blue smoke and a fantastic circle which left a trail in the shape of a Q in the sky. We watched her on and off all day until - with the weather clearing serendipitously - at 6pm she began manoeuvring out. There were hundreds other boats round about, entirely dwarfed by her; the Cally Mac ferry looked like a little toy boat by comparison. Kimberly gives a wonderfully evocative description of watching from Dunoon Pier. It made the BBC evening news, but apparently merited only ten seconds and a poor shot of her in Greenock Terminal. Shame on you Beeb. Due to a wedding and a funeral and our rector's inability to split herself in half, we had an unexpected eucharist last night (to reserve the Sacrament for Sunday when she'll be in Rothesay). What a treat it was! Clouds of incense, lots and lots of candles all over the sanctuary - so many I feared for the rector going up in smoke herself when her vestments swished a little too close for comfort - and all for me and two others. It was bliss. I'm doing the sermon on Sunday and I felt that God had really given it his best shot now and it's up to me to do him justice. The midges were waiting for us outside, but even they couldn't break the mood. It's the time of year when my fingers seem to be permanently stained purple - bramble season is upon us once again. Thirty two years ago next week I was brambling while nine months pregnant, and Number One Son was born the following day, so I always know when to start looking in the hedgerows. This year, they're a wee bit early and the hedges are already groaning with lovely big brambles. The dogs are resigned to their walks being punctuated by their person periodically diving into the bushes and emerging with scratches, purple fingers and a full poo-bag that looks as if I've been cleaning up after an elephant! Yes, the poo-bag that I always carry in my pocket has another use in September. I'm retired from teaching and happily occupied with my family, my friends and my interests.